For successful lawyer Mimi, 1980s Washington, D.C. is a far cry from the war-torn Vietnam of her childhood. Time and sheer force of will have allowed Mimi to put those turbulent years behind her-that is, until the postcards begin to arrive. Postmarked from Thailand, each card is simply yet beautifully rendered in the hand of an artist identified only as "Nam." Mimi can't imagine who Nam might be, a prickly problem considering his brief notes make it clear he knows her quite well. Determined to unmask him, Mimi begins what will become a decade-long search for Nam. 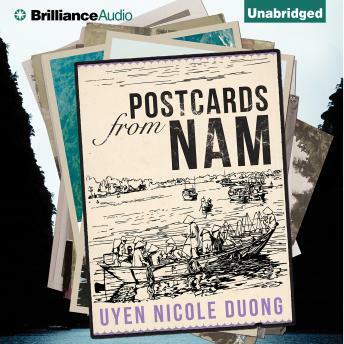 Her quest eventually leads her back to her childhood home in a small alley in pre-communist Saigon. For there she was beloved by a boy who dreamed of one day being an artist, a boy whose path diverged tragically from Mimi's when the Vietnam War ended in 1975.. Yet, as she digs deeper into Nam's painful past, Mimi uncovers an inspiring story of courage, survival, and the indomitable strength of the human spirit.